The first thing to understand about Hideo Yokoyama’s epic police procedural Six Four is that it is not a crime novel in the traditional sense. There are plenty of crimes, including a fourteen year old kidnapping case, a hit and run and some corruption, and the plot centres squarely on the police force. But the crimes themselves are merely the catalyst for the action and little of this action is directly connected to solving these crimes. Most of the procedural action that readers might expect from a traditional crime novel either happens off the page or not at all. And even when the action ramps up, most of the tension comes from internal police department politics and the external pressures of the press. Six Four is the code name for a child kidnapping case from fourteen years before. The ransom was paid, the perpetrator escaped but the child died. Many years later, this famous case is still in the public consciousness and is still being pursued by the local detectives. The shadow of Six Four hangs heavily over all of the action of this novel, still impacting on many of the lives of those who participated in the investigation. The narrative centres around Mikami, a former detective and member of the Investigative Branch who has been moved out of the front line to run the Police press office. The press office is part of the Administrative Branch and is responsible for managing the flow of information from the police force to the press. Mikami is distrusted by his new superiors as a former member of the Investigative Branch and shunned by his former detective colleagues as a turncoat. Mikami is also carrying deep pain. His teenage daughter has run away from home and has not been in contact with her parents for eight months. When he comes into conflict with the press corps and is then asked to organise a visit by the Chief Commissioner to pay his respects to the father of the victim of Six Four, Mikami’s world starts to collapse around him. The action in Six Four is mostly generated by the tension between the police and the press over freedom of information and the internal ructions of the police force, a conflict between the detectives and the bureaucrats. Mikami walks a fine line between these two factions while also using his skills a detective to understand what is driving them and trying to do right by the victims, who seem to be forgotten in the struggle. 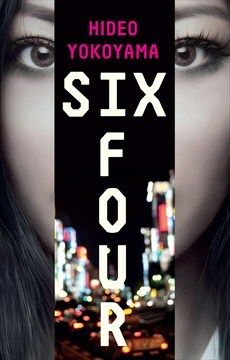 Six Four is an intensely humanist crime novel. Its focus is on the relationships that these public servants forge with each other and the outside world. It considers the cost of working for the police and the impacts of a sometimes poisonous culture on the individual. Characters like Mikami’s wife Minako, herself a former police officer, are sympathetically portrayed. But it also explores the power of persistence, with many people, including Mikami, still focussed on the belief that they can solve a crime that occurred fourteen years before. Six Four is not an always an easy read. The conflicts between the Mikami, the press office and his superiors are relentlessly detailed. The investigation that Mikami is conducting is often frustrated as much by his lack of access and power as by machinations behind the scenes. Given the sheer number of characters, an organisational chart of the local police force would have been a great help. But while it builds slowly, Six Four comes together in a tense, sleep-deprived finale where the sins of the past crash headlong into the manoeuvrings of the present. While not a traditional police novel, by focussing on the police administrators, Six Four gives a new perspective on the crime genre. There are no crazy serial killers, no high pressure interrogations, no solo heroics. And while not providing the satisfaction readers usually expect from a regular police procedural, or maybe even because of that, it can be a rewarding experience.